Northmor senior Cristianna Boggs signed her letter of intent to play softball for the University of Charleston on Wednesday. Parents Dave and Missy are in the front row with her, while in the back row are (l-r): travel ball coach Shayne Yeater, Northmor principal Benjamin Bethea and Northmor softball coach Russ Montgomery. 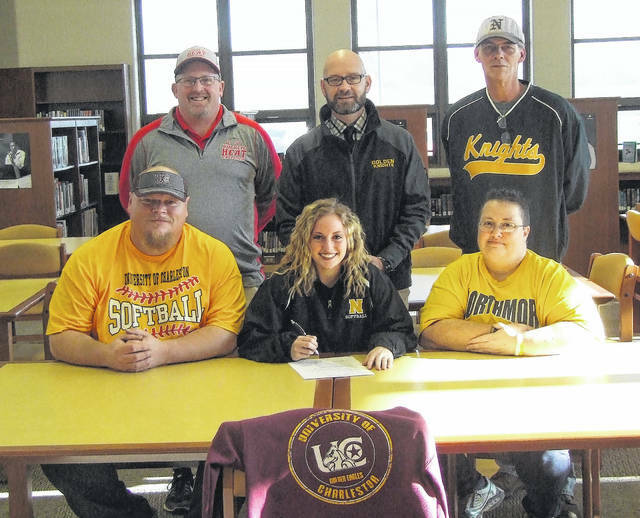 Northmor senior Cristianna Boggs signed her letter of intent to play softball for the University of Charleston in West Virginia on Wednesday. Boggs, who will be majoring in nursing while playing for the Division II school, liked Charleston for both the softball and nursing programs. She added that she’d considered a number of other schools, including Muskingum, Otterbein and Ohio Dominican in Ohio, as well as Chowon in North Carolina, but said that the staff at Charleston let her know she had a chance to step onto the field as a starter during her freshman season. Boggs will be playing in center field. She is expecting there to be some adjusting to college life, particularly because of the distance between the university and her home. However, she noted that she feels she’ll bring a lot to the table, adding that the staff at Charleston liked a lot about her game. “They were interested in my speed and running the bases and they liked my intensity because I don’t want to lose,” she said.